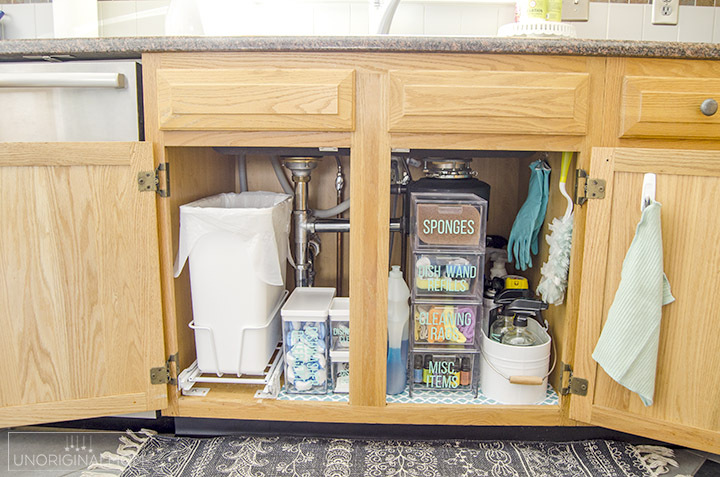 Under the Sink Organization: Before and After! 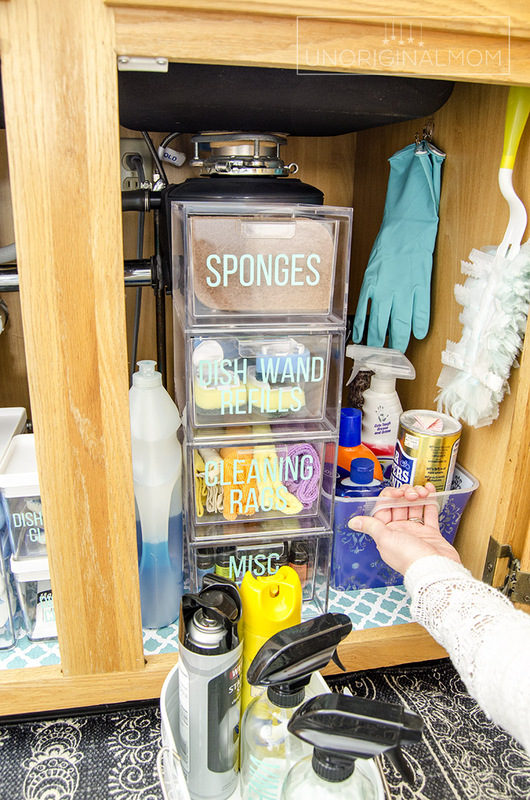 Here’s how I tackled under the sink organization in our kitchen sink cabinet – it’s practical, functional, and pretty, too! 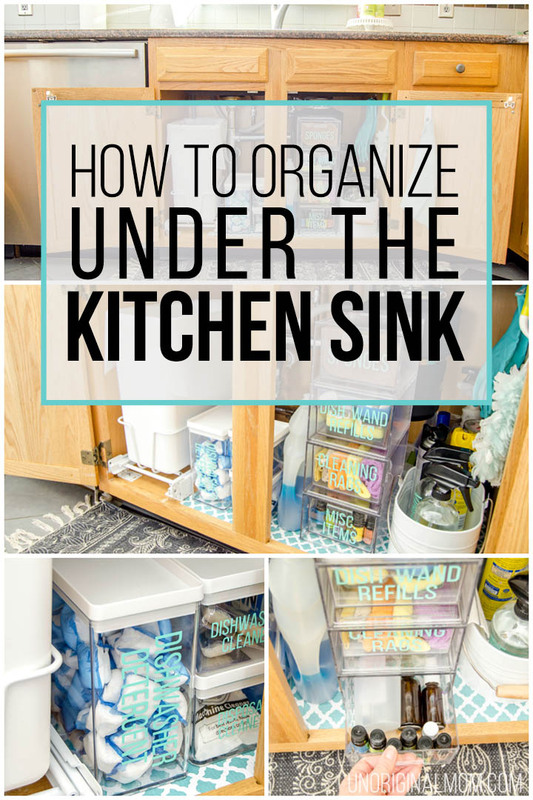 An easy run down on how to organize under the kitchen sink. I’ve said it before…I am NOT a naturally organized person. It’s something I have to work at purposefully. I can clean out spaces over and over, but inevitably they’ll just go back to being a mess…unless I work to put together some kind of organizational system that fits the needs of that space. It is more work up front, and usually a little bit more expensive (bins and baskets and drawers, oh my! ), but long term it’s totally worth it. So, one of my goals this year is to tackle some more spaces in our home and get them organized. Thinking about organizing our entire home is extremely overwhelming, but doing it one small space at a time is a little less daunting. First on my list was our cabinet under the kitchen sink. Such a frustrating space with all that gosh-darn plumbing underneath, taking up space! We also have our trash can under the sink, so that takes away even more space. 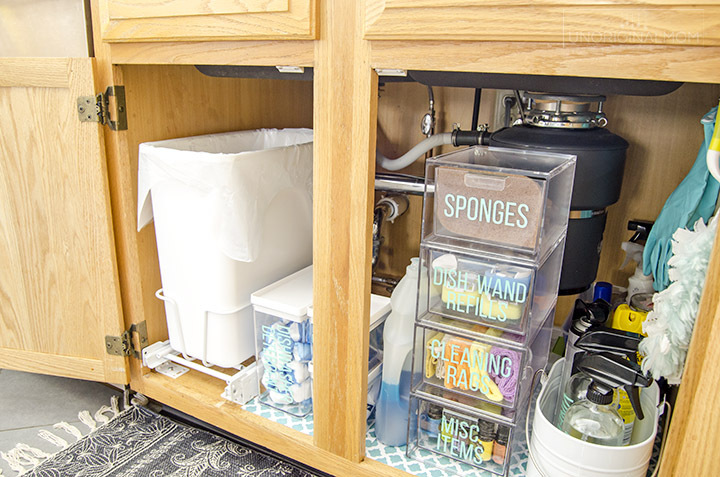 My husband bought a new pull-out trash can, and so when he was getting ready to take out the old one and install the new one, I knew it was time to give our under the sink cabinet an organization overhaul. Because…well…just look at how it was before. Yikes! Not as bad as it could be, certainly, but lots of room for improvement. (And what you can’t see in this photo is two really dirty and gross bins full of all kinds of random odds and ends, ew.) The first thing I did was scour Pinterest for inspiration, of course. 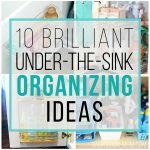 I rounded up my 10 favorite under the sink organization ideas here. Then I planned out our space, bought a few drawers and containers, and got organizing! This post contains affiliate links. Click here to read what that means. Of course, the first step was pulling everything out from under the sink and cleaning it out. Yuck. To make the cabinet easier to clean and to give it a pop of color, after I cleaned it out I added some Contact Paper Shelf Liner before I started putting things back in. 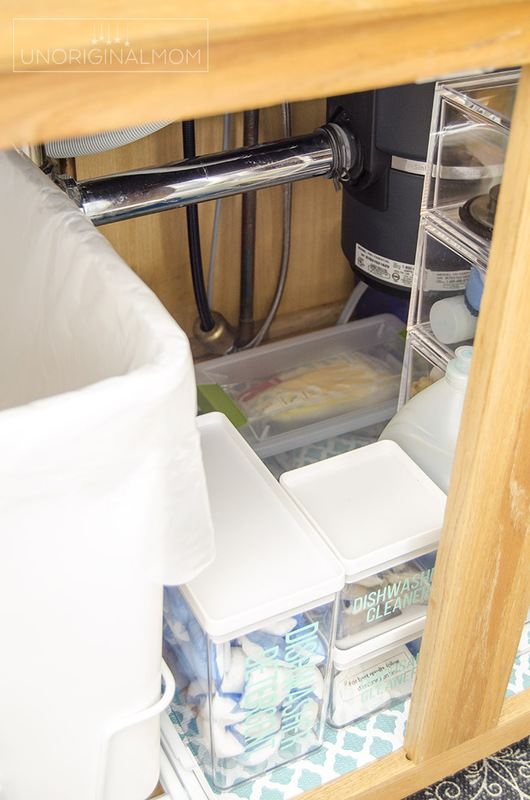 Ready to see the “after” of our under the sink organization project? Here it is! You can see I used some small command hooks on the side of the cabinet to hold our Swiffer duster and rubber gloves. It’s nice to have them up and out of the way, but easy to grab when needed. We don’t actually use many different cleaning products regularly…we’ve switched to using Norwex clothes for almost all the surfaces in our home! I love that it’s chemical free, but even more so I love that it works even better than spray cleaner and paper towels. Previously we had a little under-cabinet towel bar, but it was going to get in the way of my drawers and bins so I took that down and added a command hook to hang our Norwex Kitchen cloth. 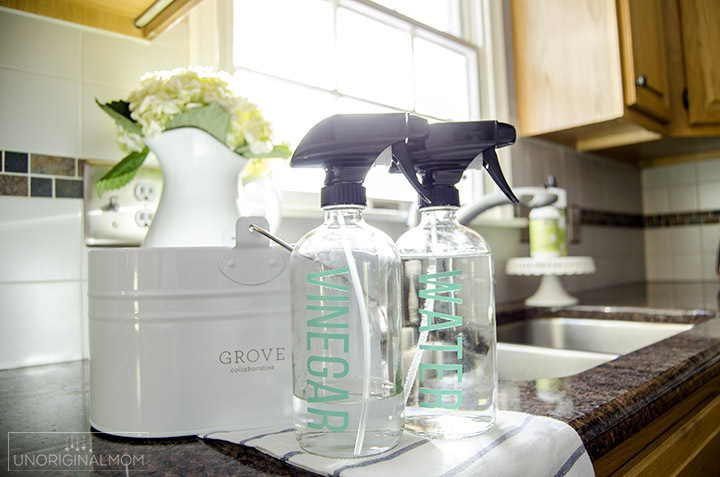 As far as cleaner bottles go, I put our most-used bottles in my Grove cleaning caddy. It’s easy to pull out whenever I need it. I actually have two glass bottles (these are the ones I have) that I use the most – one with plain water that I use with my Norwex cloths and one that has a vinegar and water solution. They got quick vinyl labels to tell them apart. 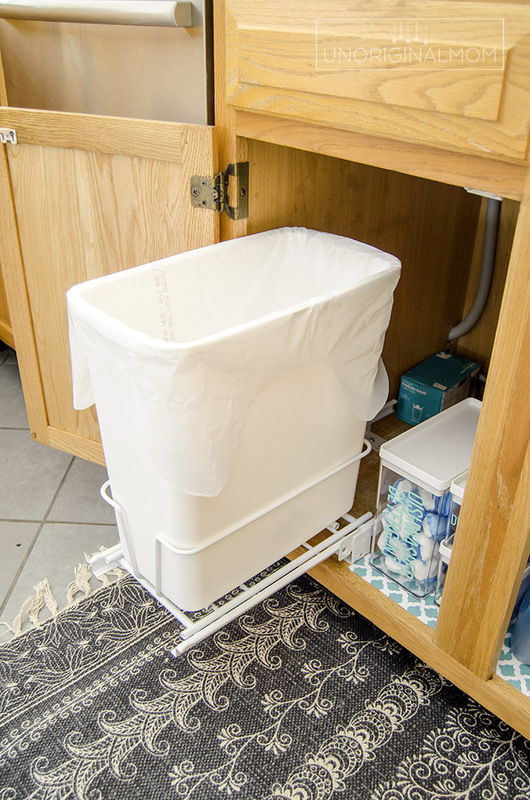 Behind the cleaning caddy is another bin with more odds and ends of cleaning supplies that we use less often. 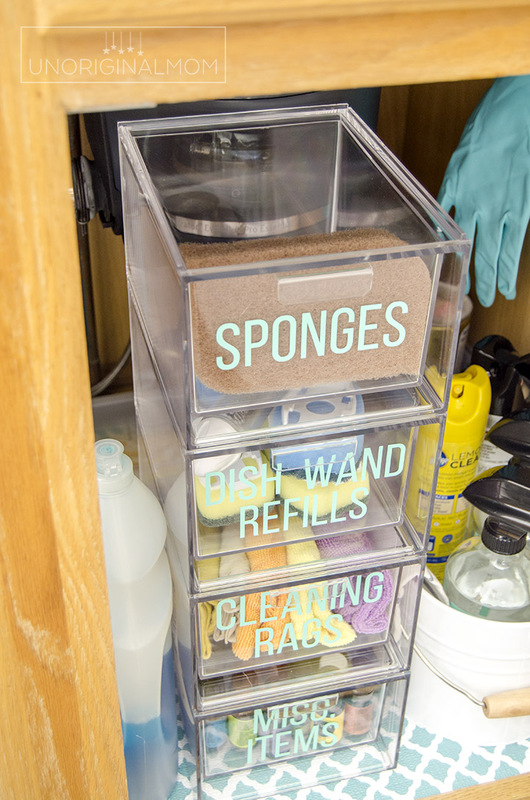 Next to the caddy is my favorite part of the cabinet – these pretty acrylic drawers! I stole the idea 100% from Abby over at Just a Girl and Her Blog. 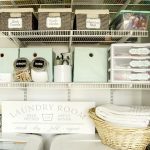 She used them in her under the sink organization post a while back and I loved them (make sure you go see her great organizing ideas!). 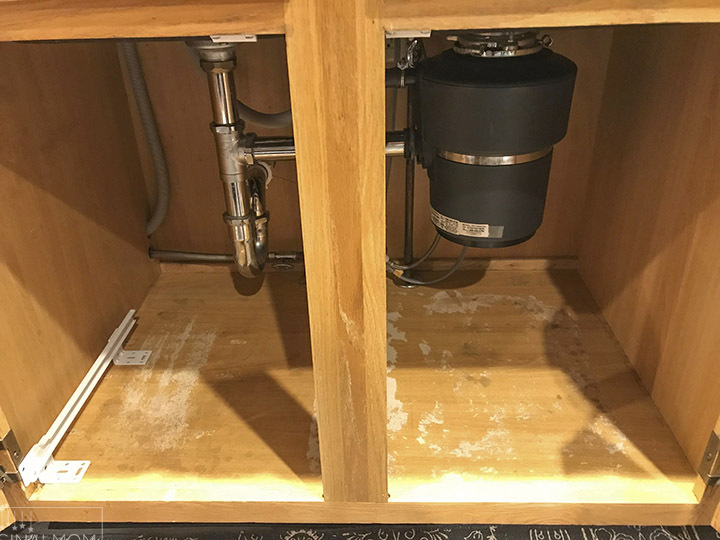 They’re such a great use of space in front of the garbage disposal, and a perfect way to keep smaller things organized and separated. Of course, I used my Silhouette to cut vinyl labels for these drawers, too. 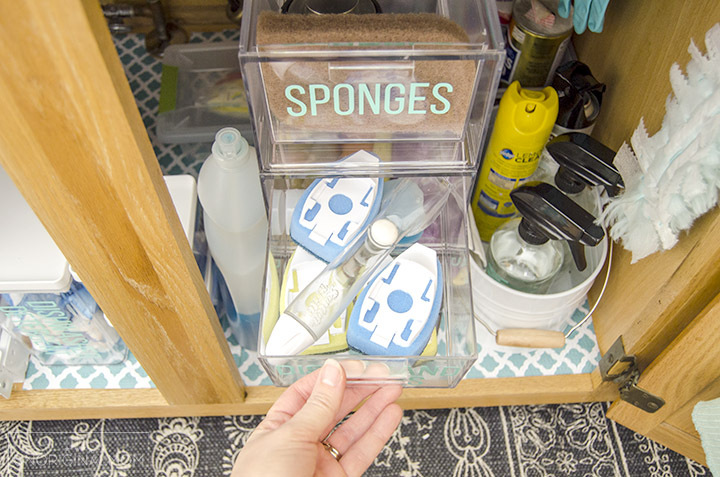 I have a drawer for sponges, one for our dish wand sponge refills and one for cleaning rags (most of my cleaning rags live in the laundry closet but these are the ones that I use with our stainless steel cleaner or our furniture polish). 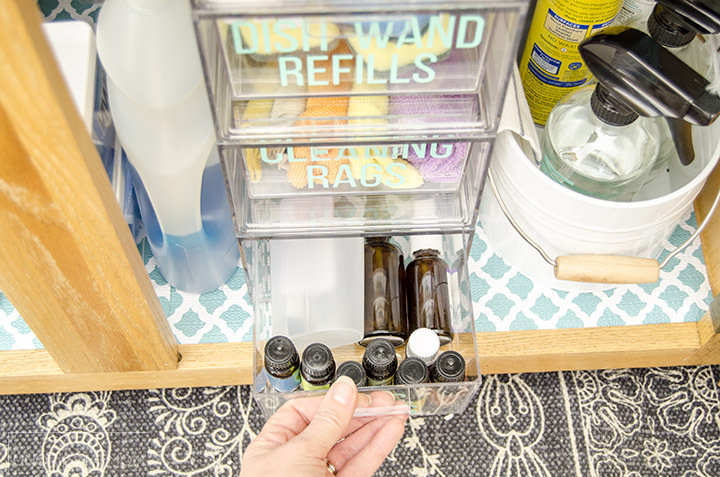 The bottom drawer I originally labeled as “miscellaneous” until I realized it was a perfect fit for my bottles of essential oils! I am not a big oil user, but I do like to diffuse them for fragrance and have about a half dozen bottles plus a few spritzer bottles. This works really well for them! 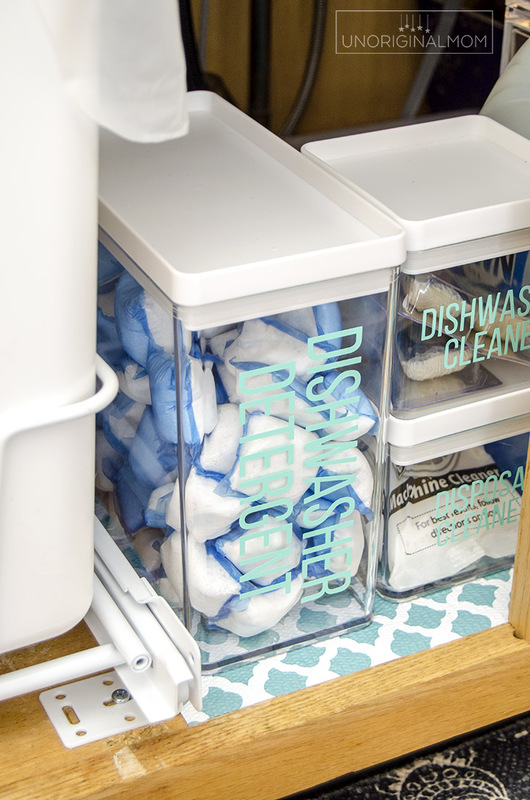 On the other side of the cabinet, I used some food storage containers from Target to store our dishwasher detergent packets, our garbage disposal cleaner, and our dishwasher cleaner. I don’t know if you can really see it back there, but I found a lidded bin that fit underneath the garbage disposal to store some rarely used items – an extra stopper for the sink, a second pair of rubber gloves, and a few other small random items. Since it has a lid on it I can easily reach in and tilt it to get it out if I need access to any of those things. One more time…isn’t it pretty??? It’s been organized like this for a few weeks now and is functioning really well. I can quickly grab what I need, but best of all it’s really easy to put things *away* into their place, so things don’t get thrown in randomly. It feels so good to have one more space organized and checked off the list. I have a few more I’d like to tackle this month, so stay tuned for more real-life organization ideas! 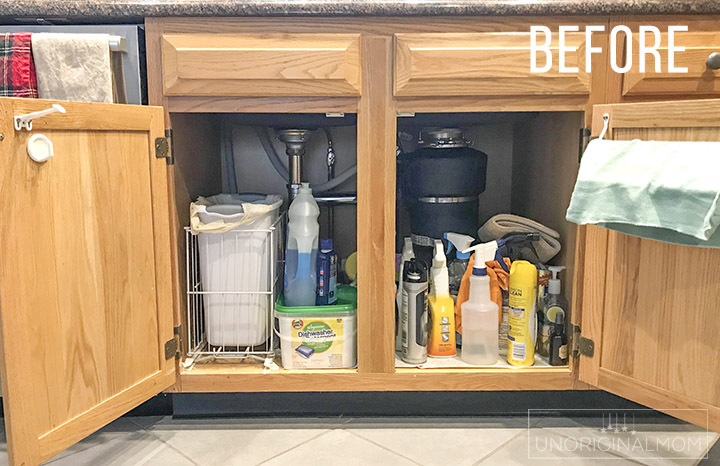 20 Responses to Under the Sink Organization: Before and After! Looks amazing!!! I love those acrylic drawers! Perfectly done! You inspired me to get busy with mine! I have so much more stuff than you that needs to find another home! Thank you for great ideas! Love these ideas – and the kick in the tush to get busy doing it. Hehe well I’m glad to be a (hopefully pleasant) kick in the tush when needed ;-) Thanks Donna! The Amazon review says the small boxes are “stackable” but not “nestable,” meaning they could slide all over. Do they? Oh no they stack securely with a kind of groove on the bottom of each drawer that fits inside the top of the one underneath it. No sliding at all, they’re sturdy! I love how this turned out! Bookmarking the post for later. Thanks a lot for sharing this! I just ordered the larger acrylic drawers to put in my dresser cabinet to sort and store cosmetics and face and body lotions. Love how your kitchen sink cabinet looked in the “after” pix. I moved in as a caregiver for my Mom and I did under her kitchen sink – it really makes you feel good when you can reach in time after time and it stays organized! I love the before and after! Looks great! 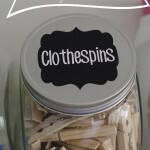 Could u tell me where u we’re able to find the lettering to label each container? Thanks Natalie! I used my Silhouette to cut the labels out of vinyl myself. 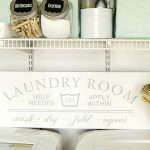 I have been trying to look for vinyl letters I can buy that look like that but no luck. Would you be interested in selling labels to me due to me not owning a silhouette machine? Or would u know a website I could have these made? I don’t make items for sale, sorry…but there are lots of sellers on Etsy that do custom vinyl, I’m sure you could find something there! Excellent work, especially the container idea. If you want to use even more space, the internal part of the cabin doors is an area to consider. Different small objects like scrubbing brushes, for instance, could be hanged there on sticky wall hooks. 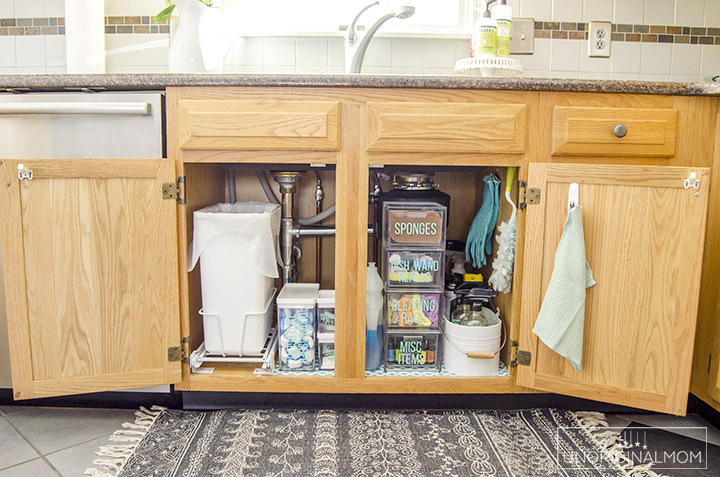 Thank you for the inspiration to organize my under the sink cabinet! I bought a silhouette and can’t wait to learn to use it. What size labels did you make? 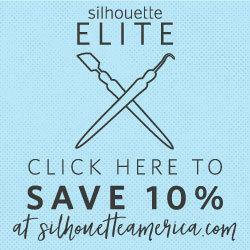 Oh you will LOVE your Silhouette! I cut them all to the size of the containers I was using, so I don’t have an exact measurement…when doing labels like this I usually measure the size of the surface and then use the rectangle tool in Silhouette Studio to draw that size on the screen, and then size my design inside that. Hope that helps!